Thank you to all of the individuals and businesses who have become members and sponsors of our organization through the years. As our 2019-2020 season approaches, we are hoping to generate new opportunities as well as continue to provide quality Community Theatre and continue teaching local children valuable life skills through theatre education. 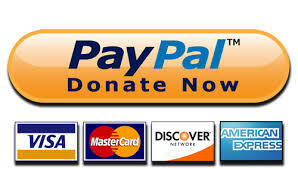 We also will be continuing to provide an outlet for local artists and technicians to develop and exercise their craft. 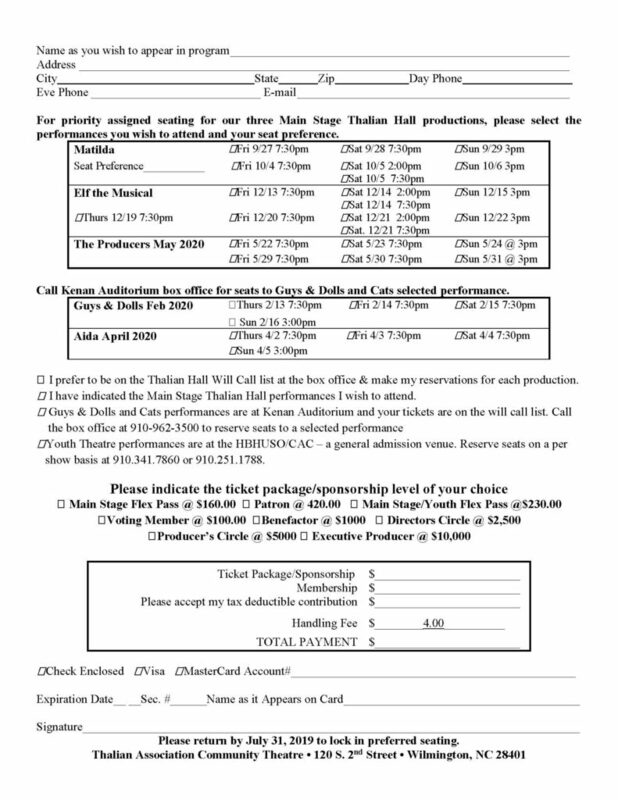 If you have not done so already, please browse this website for our 2019-2020 schedule of productions as well as information about who we are and what we do. We are more than just the Official State Community Theatre Company of North Carolina. 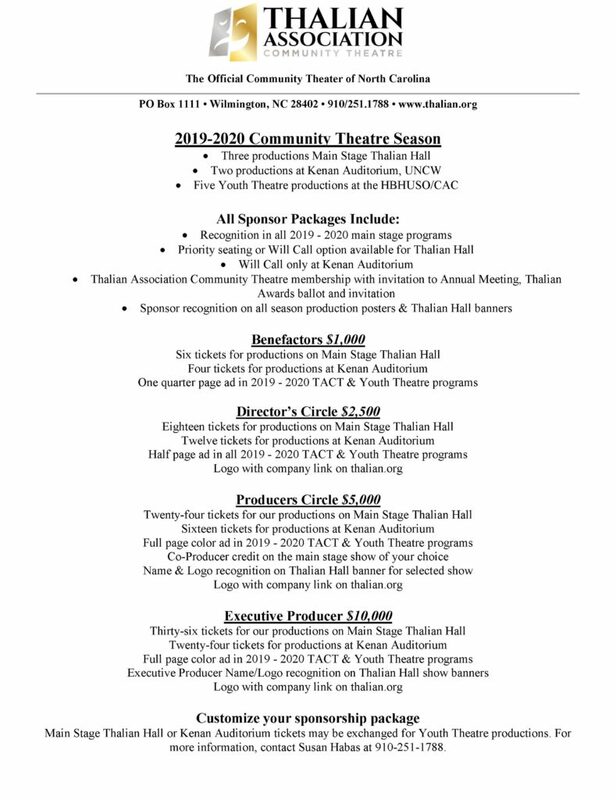 Your support and belief in the mission of the Thalian Association Community Theatre is what makes all of our programs possible. Tracing our roots back to 1788, Thalian Association Community Theatre was founded to enhance the rich artistic environment of the Cape Fear region. Today, our Youth Theatre presents five productions annually with auditions open to performers ages six through high school seniors. Our Youth Theatre Academy offers classes in various theatrical areas such as acting, movement, audition techniques and technical threatre. Through our community outreach program Theater 4 Change, we send instructors to the Community Boys & Girls Club. The Brigade Boys & Girls Club, the YWCA, and the Girls Leadership Academy of Wilmington to teach theatre arts and support the enhancement program offered through New Hanover County Schools. As professional managers of the Hannah Block Historic USO/Community Arts Center, Thalian Association Community Theatre provides arts instructors with opportunities to teach classes at the Community Arts Center at reduced rates and visual artists have new opportunities to showcase their work in our new Community Gallery Space. As always, we will continue to provide space for rehearsals and meetings to qualifying non-profits at no charge to encourage and support the arts at all levels. Of course none of these things would be possible without the support of the community and businesses like yours. Please consider becoming an Annual Sponsor of the Thalian Association Community Theatre.